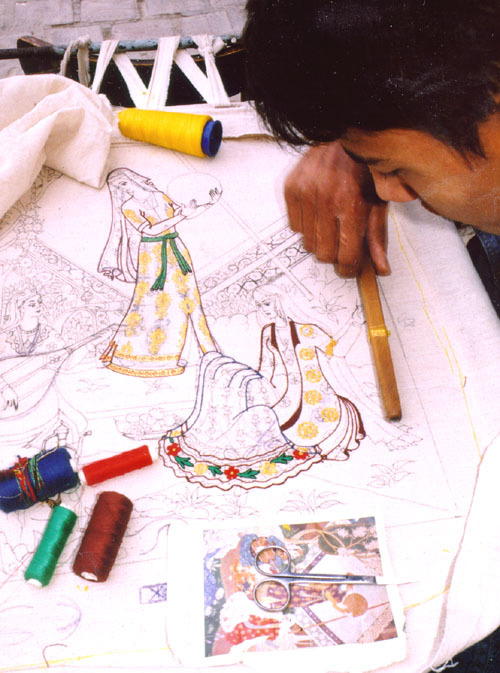 An escorted textile and craft tour through the 'Silk Routes' from China to Central Asia. A tour for the discerning with Footprints Tours Ltd.
With little advertising, our last eight Threads in the Sand' tours sold out quickly. 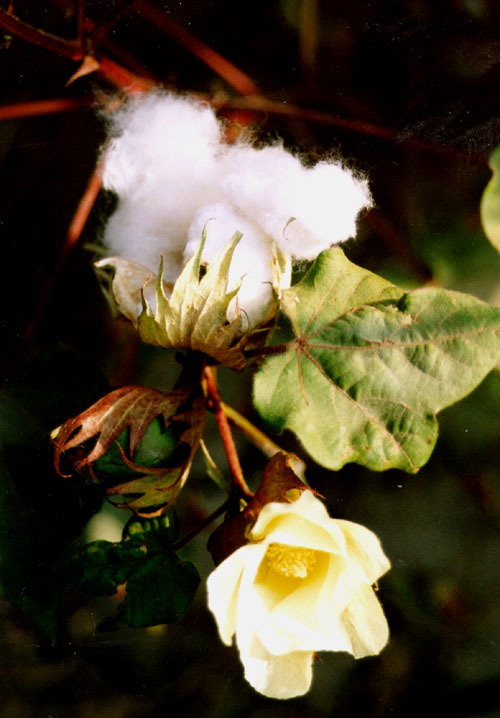 We enjoy taking this tour and because of the level of interest will take another excursion through the lands of silk in 2013. 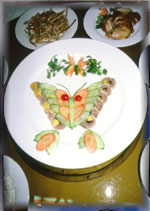 This page gives the flavour of our Silk Road experience. Our 2012 tour is closed. Our next Silk Road tour is in 2013. If you want to put your name down for this tour or enquire further please email your request. You may wonder about the need to reserve a tour, years in advance. Well...we run only a few tours each year. They are specialised, personally conducted and, indeed - very different. If you want to know how special, please ask and we shall provide you with contacts who have taken this tour. It is indeed - special and 2013 will come around sooner than expected! n 1997 I chanced upon an exhibition at the Museum of Fine Arts in Boston. It remains the most visually stunning exhibition I have seen. I was entranced by the vibrant colours and bold designs of ikat silk from Central Asia and intrigued by the possibility that these gorgeous textiles might still be produced in ancient lands of the Silk Road. 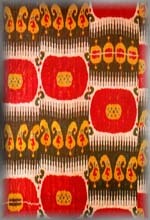 I was fascinated by the bold use of these textiles for personal clothing. It was apparent that individuals, both men and women, would compete in wearing the most stunning designs and at times would wear several charpans (silk coats) at once! Inside their homes large ikat-silk and embroidered panels were hung as decoration. 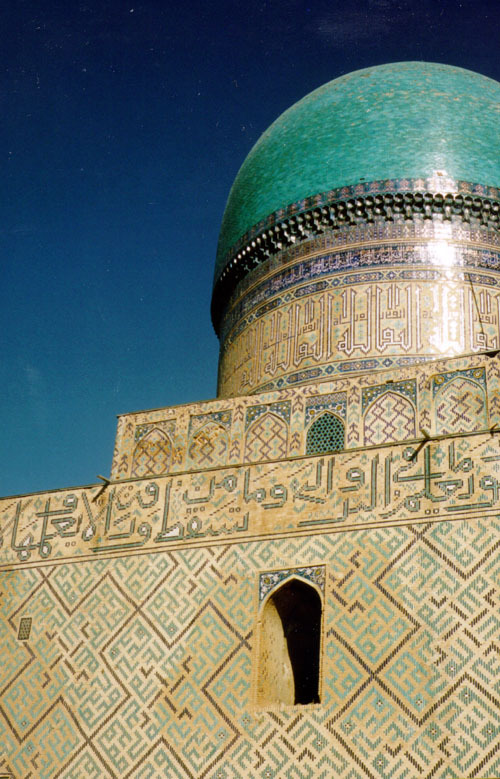 On a quest to see more of this, Diane and I visited Kyrgyzstan and Uzbekistan. 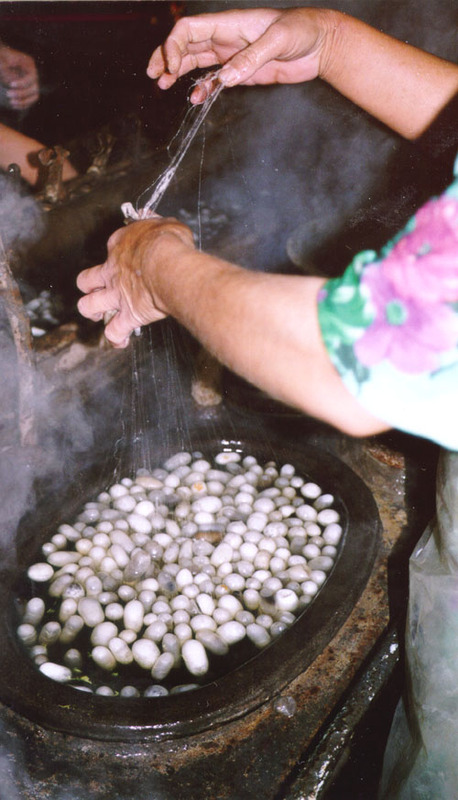 We discovered surviving remnants of the craft and journeyed to the origins of the silk industry in China. This tour is a compilation of what we found then and during several subsequent visits. It is a response our initial, and persisting, enthusiasm and a celebration of the marvellous history and crafts of China and Central Asia. 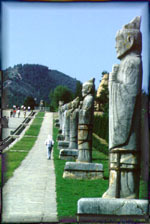 It is a chance for you to share in the history and glories of the Silk Road. 'You can extract the essence of a place once you know how. he idea is to start our tourist activity in China at Xian, the ancient capital of successive Chinese empires and to journey west from there along the route established more than two thousand years ago: 'the Silk Road'. Our 'furthest-west' point will be Khiva, once a major stageing post. We fly into Xian via Bangkok and return to Bangkok from Tashkent in Uzbekistan. From Xian in the east to Khiva in the most western deserts of Uzbekistan it takes us more than six weeks to journey thousands of kilometres. A distance that would have taken years in former times. We have researched and travelled this region thoroughly so that all the major sites, and many often overlooked minor ones, are included in our wanderings. When travelling, we either have our own air-conditioned bus; fly in modern aircraft; or (for one night only in China) lie back aboard a sleeper train. Our accommodation will be comfortable 2-4 star hotels in China; home-stays and comfortable 2-4 star hotels in Kyrgyzstan; with homestays and 4 star hotels in Uzbekistan. In each case we have chosen the hotels to offer the best combination of price, comfort and location. We visit museums and crafts people, temples and tombs. 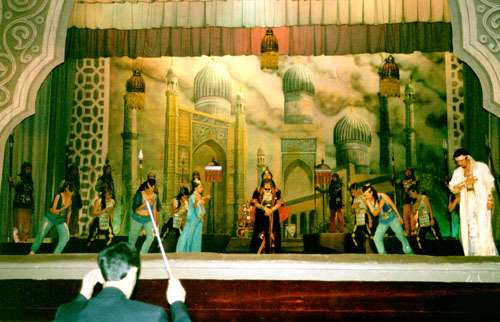 There are highly-staged cultural shows and quite impromptu performers. 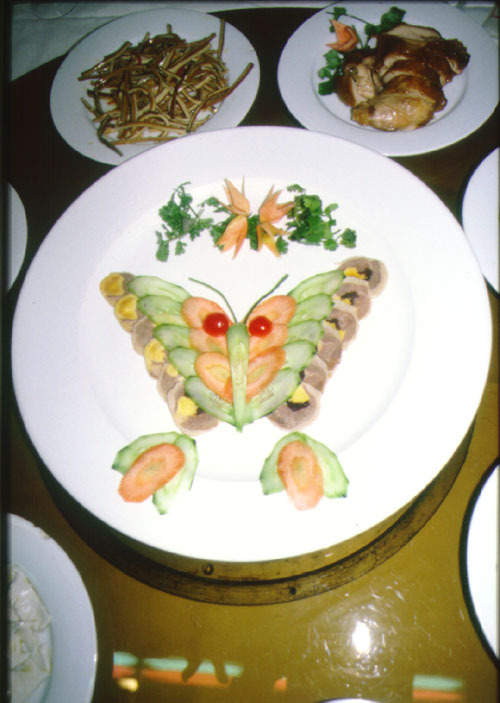 We dine at what we think are the most interesting restaurants and have sufficient flexibility to enjoy chance encounters. It's intelligent, exciting, stimulating: and fun! 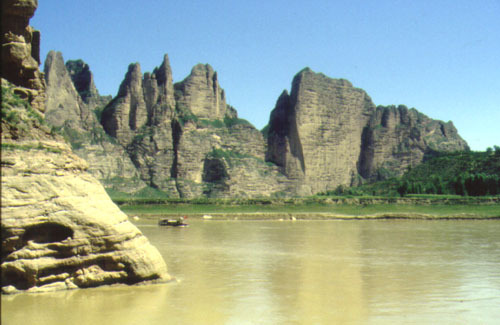 From the 'Buried Warriors' of China's first emperor near Xian, and the tombs of Imperial-royals and the buried treasures of the Tang we head by road to the cave temples of Maji Shan with their graceful sculptures; then take a boat up the Yellow River to the red cliffs and statues of Bingling Si. We take a train along the Gansu corridor, squeezed between the Gobi desert to the north and the icy ramparts of the Tibetan plateau to the south, to the southern edge of the Gobi desert and the painted caves of Dunhuang. Flying the 'northern route', we edge another, and more ominous desert, the Taklamakan which in Uigher means 'if you go in, you won't come out!' We are heading for the modern capital of Xinjiang, Urumchi, which has a museum crammed with wonders rescued from the desert sands. 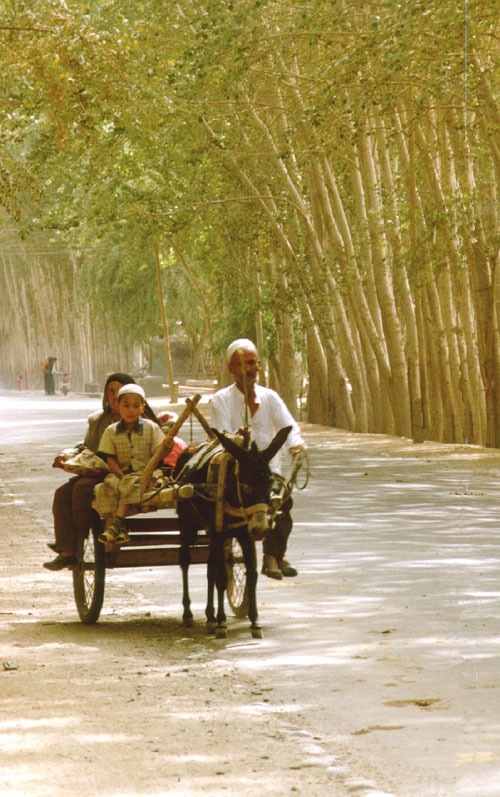 Then on by road to nearby Turpan, whose summer sands would grill an unprotected foot. 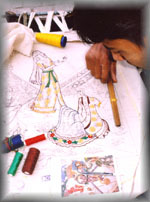 This super-dry climate has protected the ancient cities of Jaiohe and Gaochang as well as the painted caves of Bezeklik. We track on through the great gorge of the Toksun where the road is squeezed alternately by cliffs and by sand dunes to Korla. Here, a small museum contains stunning treasures. From Korla we drive via the famous ancient city of Kuqa into the Tien Shan (Heavenly) mountains. We are here to visit a very different China: clear rivers, tree draped hills and ice-capped mountains! After visiting the ancient Buddhist cave site of Kizil we drive directly across the desert: four hundred and fifty kilometres of unrelenting sand is sufficient evidence of difficult travel in these regions until very recent times. We join the 'southern route' of the Silk Road near the ancient site of Niya. It was the site made famous by Aurel Stein in the early 1900's and by more recent explorers. The city of Khotan was always the source of China's finest jade and the first city-state outside the Empire to steal the secrets of silk-culture. Today, the production of colourful hand-loomed silk is thriving, and fossicking in the Khotan river often reveals scraps of jade. In the oases of this southern region life for the local Uigher people has changed little. 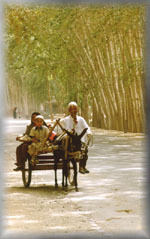 Donkey carts are the main form of transport, the men sport jaunty Astrakhan hats and the women, colourful skirts and scarves. Its very pictureseque. 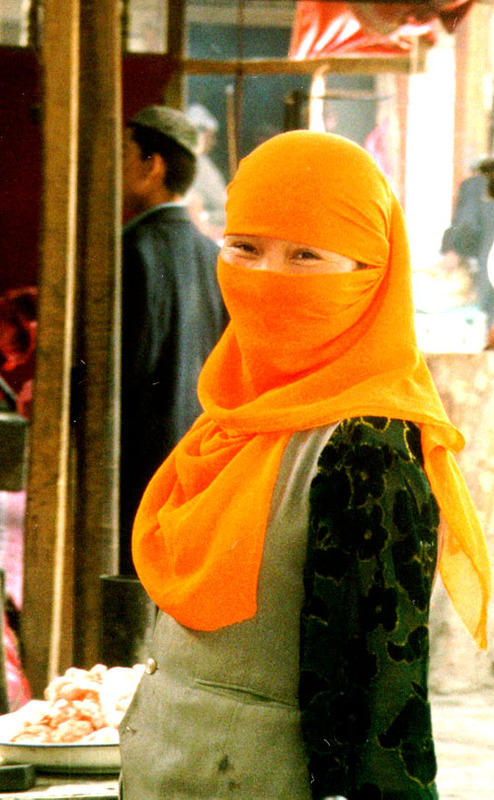 At Kashgar's justly-famed market, goods from all the countries of Central Asia are on show. You can bargain yourself a fine carpet, select an embroidered jacket from amongst myriads or design-yourself a selection of gold jewellery! 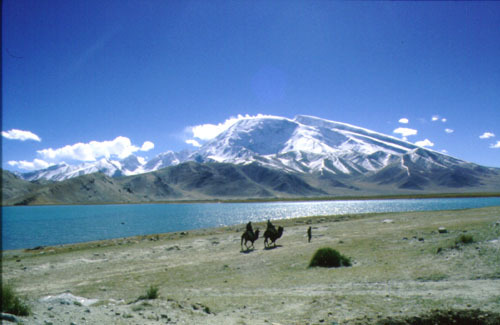 South from Kashgar, we drive high into the Pamirs to visit the fabled lake of Kara Kul, rimmed by glaciers. Around its shores graze herds of placid double-humped Bactrian camels - deliciously photogenic! Crossing into Kyrgyzstan via the Torugart Pass we enter a scenic, highland grassy plateau. Snow capped peaks rim a land empty of all but occasional herds of horses and sheep with their attendant human guards. For one night we experience nomad life by staying in yurts near the six hundred year old monument, Tash Rabat. The high lake of Song Kul has groups of nomadic Kyrgyz living for summer months in felted yurts. At Kochkorka we have a taste of family life in comfortable home-stays and will see their use of shyrdak, the Kyrgyz traditional decorated felt. Bishkek, the capital, is a lovely city of parks, pastel wooden houses and grand buildings of Imperial Russian times. After almost a month in China, the restaurants are refreshingly European, with wine readily available and cheap! 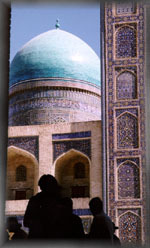 Tashkent has some of the best museums of the tour and a pleasant relaxed atmosphere. Our hotel is centrally located, allowing easy strolling to cafes, restaurants or the magnificent opera house. 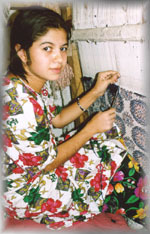 Fergana has a gigantic cotton industry and a thriving revival of handloomed ikat silk as well as distinctive pottery. We fly to the old city of Khiva. 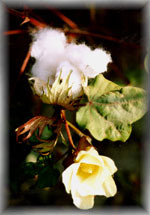 Over centuries it became rich by trading conventional silk-road-goods as well as slaves captured from Russia or Persia. 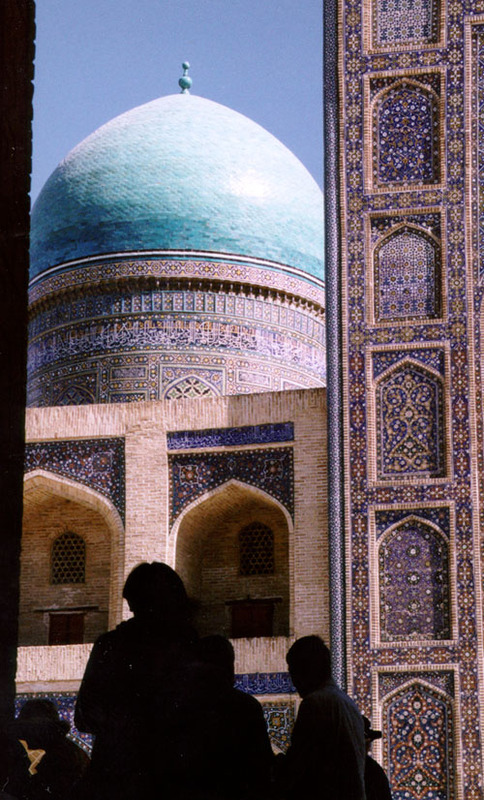 Not much trade these days, conventional or otherwise, but the bluish-green tiled mosques and towers of those times remain to make it one of the most picturesque in Central Asia. Isolated on all sides by the harsh Kara-kum desert, Bukhara was always one of the great trading centres of the Silk Road. It was, and is, the holiest city of the region. The blue domes of its mosques and madressas (religious schools) have towered above its brick-lined streets for six hundred years. In recent times the crafts of metal-work, puppets, painting and gold-thread embroidery have flourished. 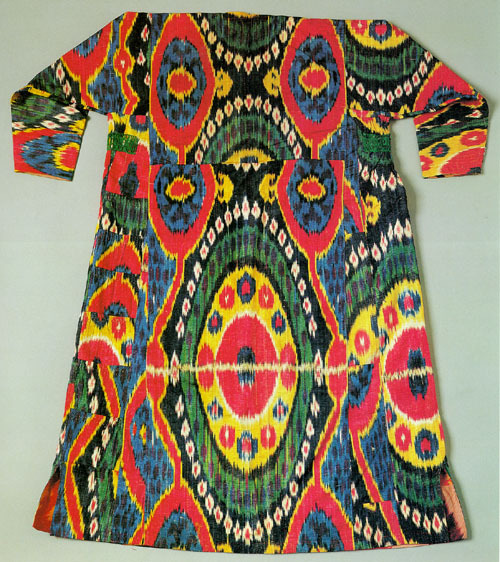 Formerly it was the major centre for ikat production and the exquisite hand-embroided cloth known as suzani; no longer produced, many examples are available in the numerous bazaars. 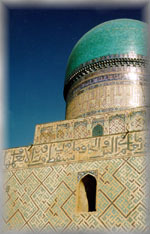 At Shakrisabz and Samarkand, Timur-i-leng (Tamerlane) allowed his considerable ego full reign creating what are arguably the greatest buildings in all Central Asia. They are certainly the biggest and most grand! 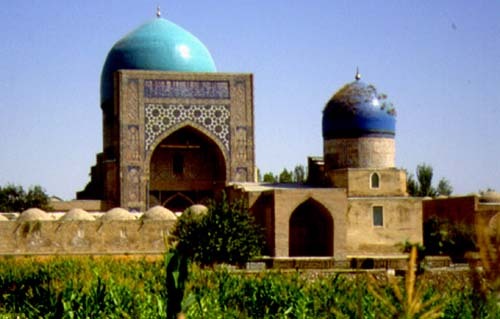 In Samarkand, the ruins of Afrosiab with its fine frescoes speak of more forgiving and luxuriant non-Islamic times ; and the remains of Ulug Bek's observatory of a period when Islamic science was both accepted and inspired. 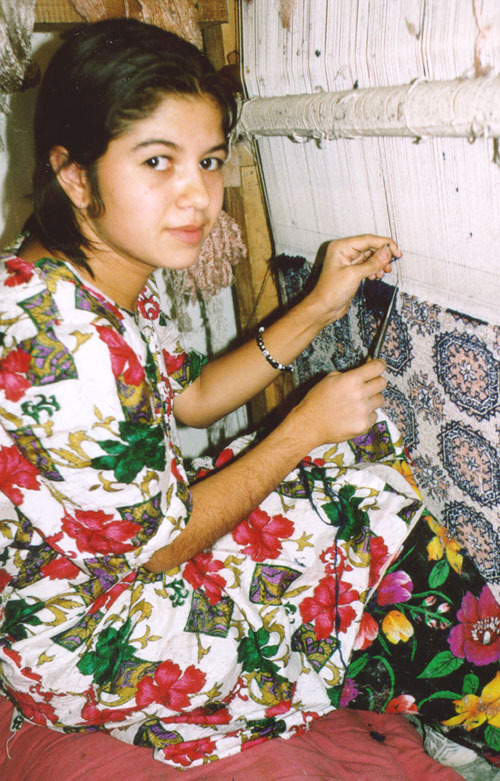 The city also boasts the best hand-knotted silk carpet factory in the world! It sounds fantastic. And so it is. But.......this epic tour involves more than seven weeks of rigorous travel from China to Central Asia. Twice, we researched this trip on the ground from one end to the other before conducting seven other groups. After each trip we have slightly revised our timetable. We beleive that what we offer provides the best possible experience. However, there are hardships related to this region's socialist heritage and their relatively recent introduction to tourism. For the most part, the countries traversed are without a recent culture of service, and with a cavalier approach to the environment. We will do our best to minimise these negatives but please be conscious that travel in these regions requires a high level of tolerance to difficulties both human and environmental. istorically, of course, it was never a single road, but a network of routes fanning out from China to India, Central Asia, Russia, Byzantium and the West. 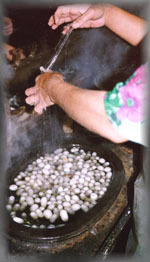 In addition to silk, the route carried many other precious commodities. Caravans heading towards China carried gold and other precious metals, ivory, precious stones, cotton, exotic animals, spices and glass. In the opposite direction furs, ceramics, jade, bronze objects, lacquer and iron were carried. Many of these goods were bartered for others along the way, and objects often changed hands several times. When the world beyond the Middle Kingdom discovered the lush beauty of Chinese silk they emptied their treasuries to acquire this new and sensuous fabric. Thus was established the most famous of all trade routes; a branching skein of links from China to Europe. Offically, it began in 138 BCE: by this time the Han dynasty had stabilised northern China around the fertile plains of the Yellow river. In fact, trade from China into Persia and the Central Asian region had been established centuries before. The great Han emperor WuDi disturbed by constant harassment from northern 'barbarians' and to protect existing trade routes, sent envoys westward. They were in search of horses and allies to defend themselves against these mounted marauders. These ambassadors returned with news of empires further to the west. Persia, Parthia, India and Rome. Trade in goods flourished and with it came great wealth. For more than a thousand years the Han capital Chang-an (eternal peace) was to be the glory of a variably-unified China. Modern-day Xian stands on the site of old Chang-an. It is here that we start our travels through the history and cultures of the Silk Road. As people moved back and forth along the route they brought not only goods but ideas. 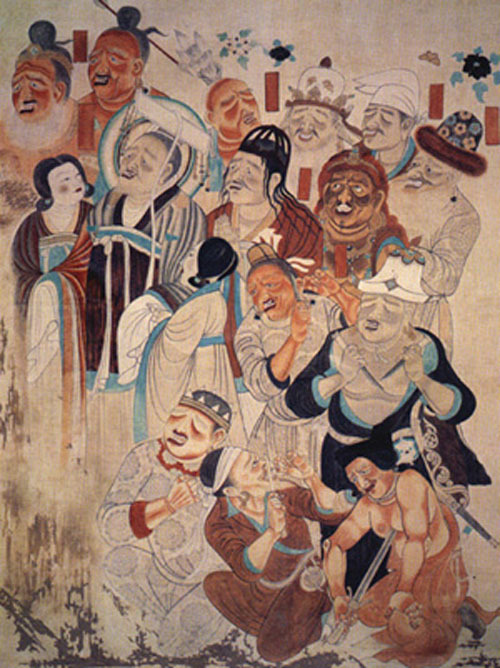 The Tang dynasties welcomed other cultures and other people. New styles of fashion, of dance and of music entertained the glitterati of the Chinese court and Chinese methods of weaving, of agriculture and technology were adopted in the west. 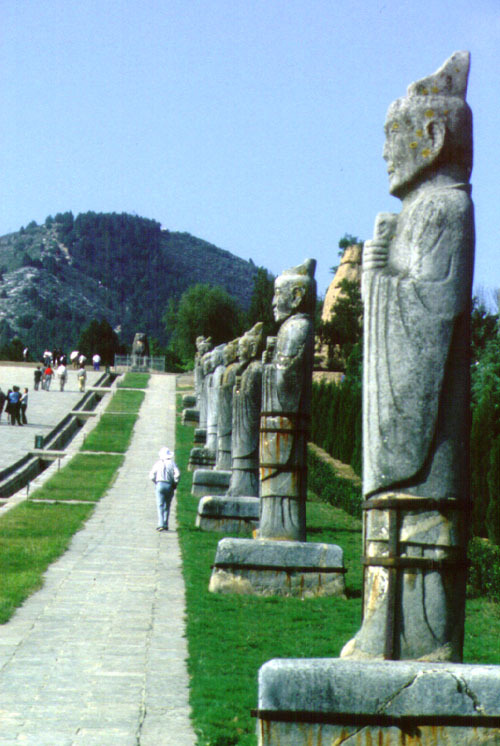 Around the 8th century, the capital of the Tang was the biggest, wealthiest, and most advanced city the world. While London was a market town of a few thousand people, Ch'ang-an and its suburbs was home to some two million people. It was religious philosophy, however which had the most lasting impact. From India, the gentle faith of Buddhism spread gradually to merge with Daoist beliefs of harmony with nature. Well established by the 3rd century, Buddhism's message of personal responsibility and relief from suffering were enthusiastically adopted both by community and the court. 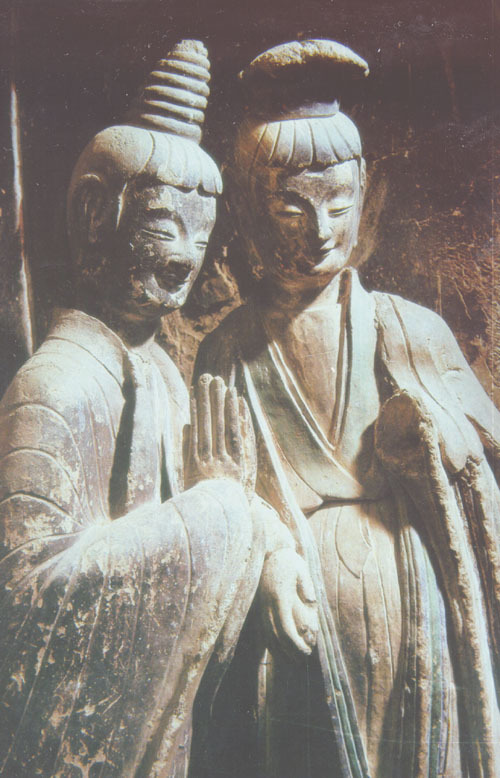 Monasteries and pagodas constructed to celebrate the new faith, were lavishly decorated with sculptures, paintings and the greatest treasures of the craftsman. 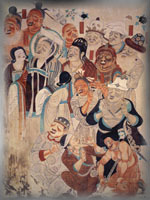 The Indian tradition of painted cave temples, was extensively developed especially around the great deserts of the Gobi and Taklamakan. In celebration of the Buddha, they crafted some of the most sublime religous art the world has seen which is still preserved in museums and sites such as Maji Shan, Dunhuang and Bingling Si. Nestorian Christianity, Zoroastrianism, Judaism and Manichaeism all made a less obvious impression on the Middle Kingdom. It was Islam, sweeping from the Middle East in the 7th century that had a chilling impact on the more forgiving cultures of China's western kingdoms. At the battle of Talas in 751 Chinese armies were defeated by advancing Muslim Turks. The Chinese lost political control of the Tarim basin and Islam replaced Buddhism as the dominant belief system throughout the countries of Central Asia. Islamic abhorrance of representations of the human form led to wholesale defacement of statues and paintings. Fortunately many Buddhist sites were preserved by the shifting sands of the desert to be uncovered by explorers in the last century. In turn, the Muslims built stunning mosques and giant towers, whose blue tiles match that of the heavens above. 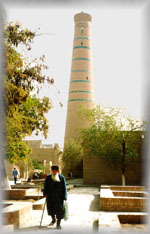 The great cities of Khiva, Samarkand and Bukhara are their legacy. 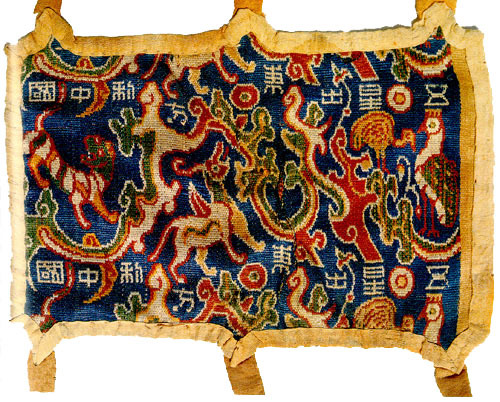 The secrets of silk production escaped from China around 500CE but Chinese dominance in production of the finest silk textiles was to last for several centuries. Hazards of the overland route began gradually to reduce both profit and pilgrimage. 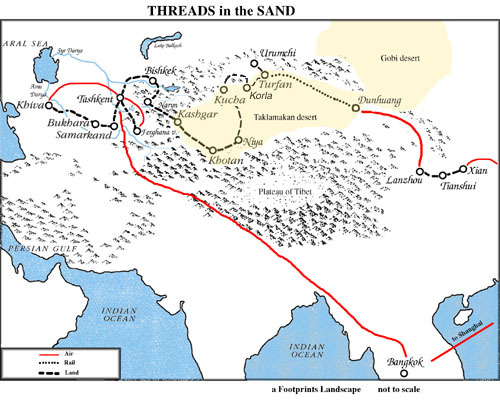 By the 8th century development of sea routes from China to the Middle East were well established and successive periods of instability along the Silk Route in Central Asia and Persia hastened the decline of trade. 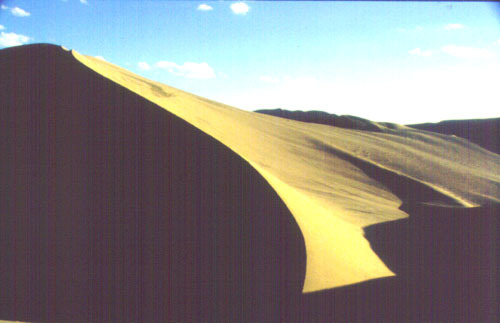 With the advent of an inward-looking Qing dynasty in the 16th century China withdrew from the world and and the once-great cities and monuments of the Silk road were covered by desert sands. Throughout Central Asia successive Khans established local rule but the attention of world powers was elsewhere. During the latter 19th century the great empires of Russian and British India jockeyed for influence in the region. At that time the region and its history was a blank. The 'Great Game' allowed explorers like Hedin, and scholars like Stein and Le Coq to uncover the secrets. And what great secrets they were! The Greek influence on Buddhist art; the buried cities of the Taklamakan; and all their former glories, were completely unknown in the west. More recent scholars have revealed the European ancestry of the remarkably preserved mummies of the Taklamakan and their astonishing weaving skills. In the 1980's huge petroleum resources were found beneath the sands of China's western desert and the steppes of Central Asia. Once again the Silk Road has become a road of riches. A more liberal travel regime in China and the opening of the republics of Central Asia to tourism has made these ancient and modern wonders accessible to the modern explorer. We pay special heed on our Footprints tour to the history of this great commercial road. Its a history of remarkable tales and extraordinary characters that make a very common bond across the shadows of the centuries. 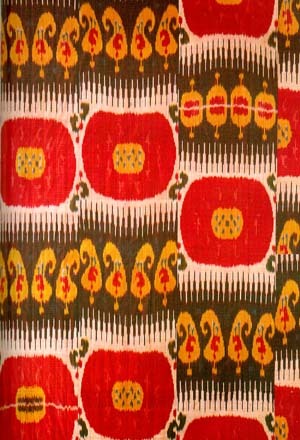 Ikat Silk: Delight, was my emotion on first seeing the ikat silks of Bukhara. That delight has not diminished. The finest of these gorgeous textiles are one hundred years old. We shall visit museums to see them en masse as well as workshops where the tradition of hand looming has revived. You will be able to see for yourselves the intricate techiques involved in their production and buy samples to take home. 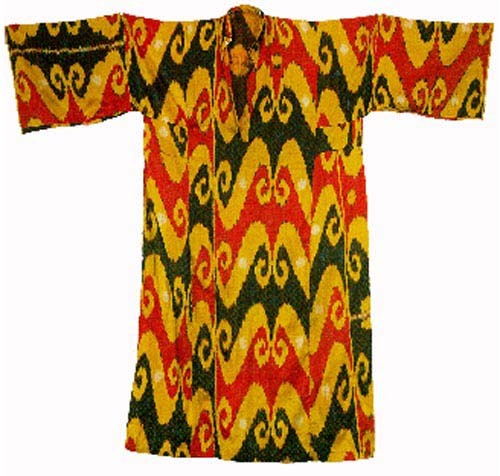 Ancient textiles: The brocade silks from the sand-tombs of the Taklamakan are more than fifteen hundred years old. These ancient relics are astonishing! Well preserved because of the extreme aridity of their original resting place, they spring into our times with vivid colours and complex weaving designs. As we skirt around the vast desert of the Taklamakan we shall visit museums where examples are on display. These have been taken from sites discovered by Stein and others. Astana, Niya, Loulan, Endere, Sampula and Dandan Oilik are a litany from the past. Buried cities from which have been rescued the most amazing treasures. 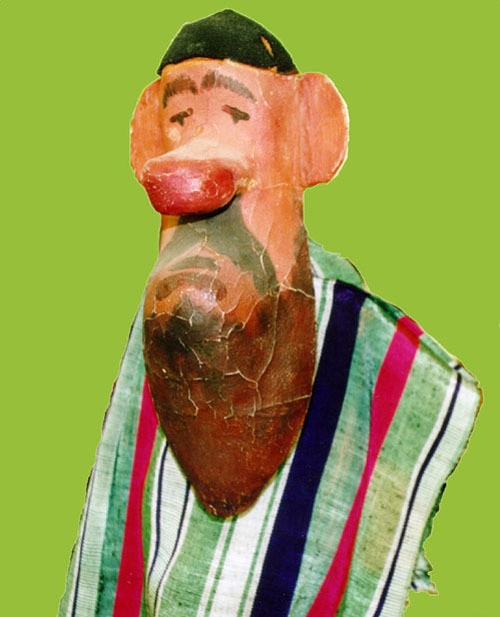 Not only textiles, but well preserved mummies, statues, paintings and writings in forgotten tongues. None who visit can come away unimpressed at the richness of these peoples lives! ". In Khotan and Fergana we shall discover its real origins and see in detail the delicate and lengthy processes involved in the production of this entrancing fabric. 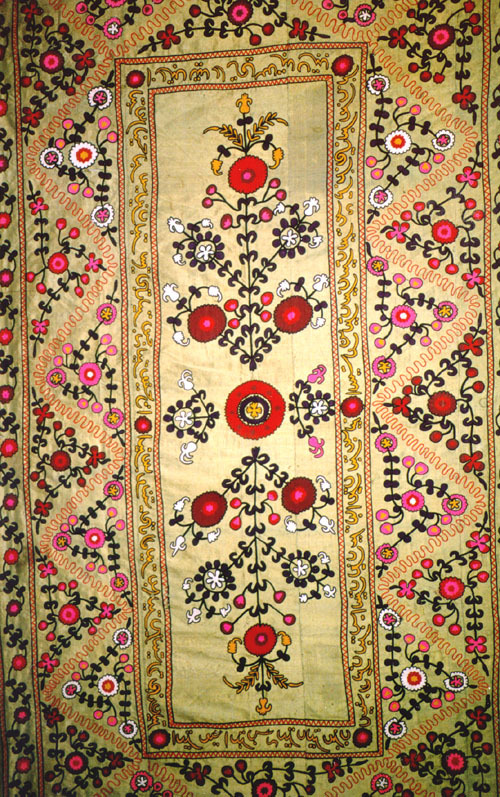 Silk embrodieries (suzanis): One of the most beautiful products of Turkestan culture are the large silk embroideries known as suzanis. These formed an important part of a bride's dowry and were intended as decorations for the interior of houses. Their area of distribution corresponds to modern Uzbekistan and northern Tajikistan. Until modern times, young girls would commence sewing their dowries as soon as they were able. 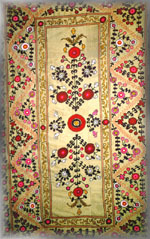 Assisted by her mother and female relatives a relatively well to do young woman would produce about ten large suzani in time for her wedding. The bold designs and subtle colours of natural dyes make suzani attractive decorations. Numerous old ones are available for purchase in the bazaars of Bukhara and Samarkand and we shall see many fine examples in museums. 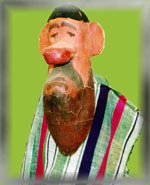 Felted wool (shyrdak):Turkoman nomads who live in the highlands use wool in many decorative ways. Their gurs (yurts) are covered with felted wool blankets to keep them warm and to exclude rain and snow. On the inside this same felting techique is adapted to make colourful bags, hangings and winding-bands suitable for a nomadic life. In the high grasslands of Kyrgyzstan we shall visit nomad camps as well as craftswomen who have make attractive shyrdak for the tourist market. 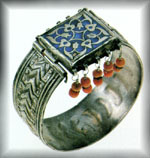 Jewellery: Turkoman tribal groups produce some of the most attractive jewellery we shall see. Beaded necklets, silver and silk hair tassles, amulets of silver and turquoise and chunky silver bracelets studded with carnelian are all available. If that's not your style a 'bridal diadem' of gold, turquoise, pearl and amythest should be just the thing for your next formal outing! If your taste runs more to gold, there should be something to suit in one of the 300 shops along 'goldsmith lane' in Kashgar. Carpets: Hand knotted woolen carpets have long been a feature of the region. 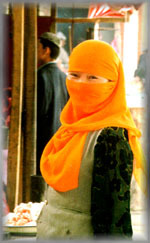 Some are produced in Khotan but the highest quality and most variety come from peripheral countries that we do not visit. We shall not see their manufacture, but thousand of new and antique wool carpets are available in the Kashgar market. Superb hand knotted silk and wool carpets are made by the Badghissi family factory in Samarkand. Refugees from Afghanistan, they provide a wonderfully entertaining tour of their enterprise. 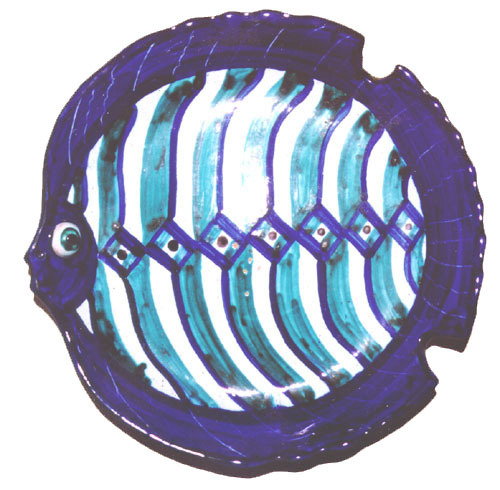 Pottery: At Riston, in the Fergana valley of Uzbekistan, there is a long tradition of hand-crafted pottery. Some modern designers have adapted their style to produce highly attractive wares. On each visit to the pottery of Rustam Usimov almost everyone has bought - and, they have got their purchase home safely! 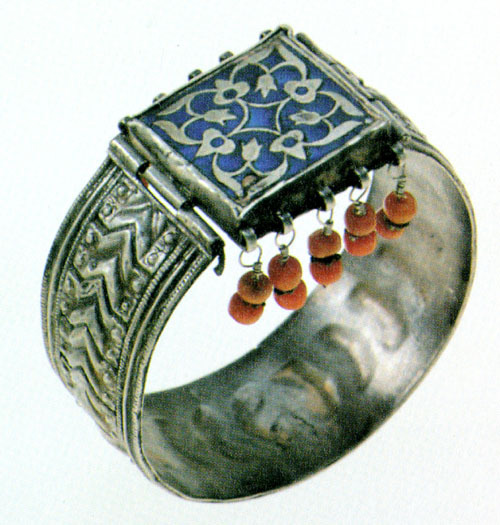 Metalwork and knives: Finely engraved or enamelled metalware is a feature of Kashgar, Bukhara and Samarkand. 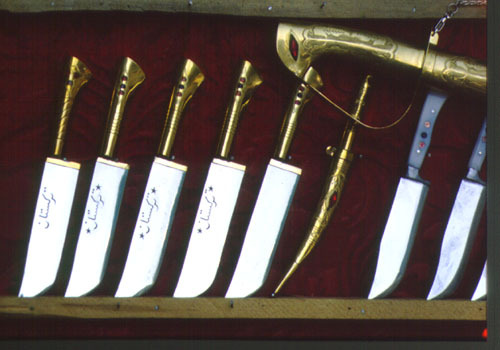 And if you fancy an elaborate knife to hang on your belt, Kashgar's the place. Painting: In all the tourist shops throughout China we shall see 'peasant art'. This is a colourful primitive style depicting scenes of rural life. Many paintings are repetitious, without flair: but every now and then there is a picture full of life, originality and vitality. It pays to look! The style in Central Asia is more delicate, with finely drawn ink sketches and delicate portraits and watercolours. 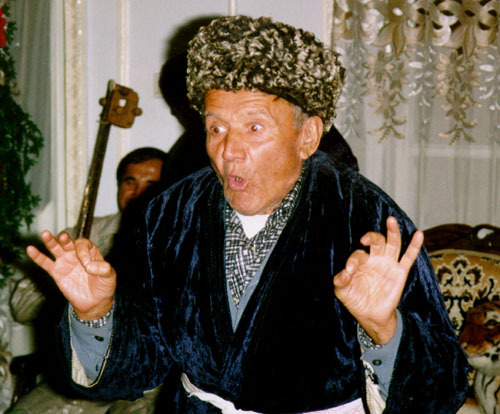 The best examples are in Bukhara and Samarkand. 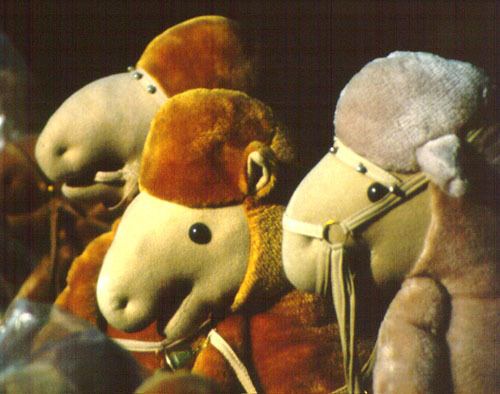 Puppets: Puppet performances are a traditional Tadjik entertainment. There is an especially inspired puppet maker selling his 'children' in the lanes of Khiva. They make ideal gifts. 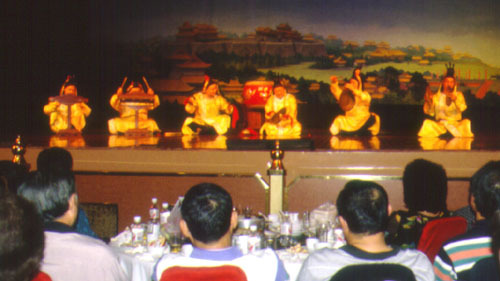 Concerts: We attend a dinner-dance show in Xian that is our introduction to the stage world of China. Drummers, diaphonous dancers, tumblers and musicians... it's a great show! Further west, the Muslim Turkoman peoples have a great love of music and dance. We shall attend several concerts. Plenty of time to develop your tambourine style! A great gift from Imperial Russia to their southern colonies was a taste for classical music, opera and ballet. The Czarists built elegant opera houses in Bishkek, Tashkent and Samarkand which were maintained by the Soviets and to this day. 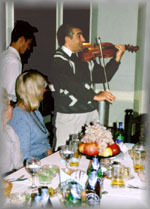 Nowadays there are quality orchestras and ballet troupes, the likes of which would grace any international concert hall. We shall be there! Spontaneous musical performances can be great fun. 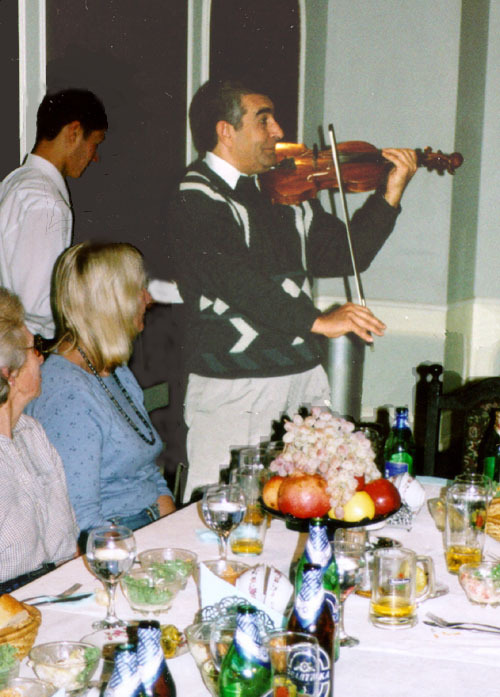 Chance encounters, mostly in restaurants, have enabled us to enjoy singers from Sichuan, a violinist from Azerbaijan and musicians from Khorazhem. It just happens.. great! This tour skirts the great Gobi, crosses the formidable Taklamakan and runs a goodly length of the Kara Kum. Each different and in their own way extraordinarly appealing: the curve of a dune, the scatterings of blowing sand and the intense colours of their native rocks. At their heart, the silence and the absence of life are unsettling and at the same time paradoxically restful. The vast distance induces respect for those travellers who walked these ways in pre-mechanical times. Even more perhaps for the Ms Cable and French who travelled by bullock cart! Although we obliterate some space by 'mechanical means' you can guarantee that if you didn't know an oasis from a karez before this trip you certainly will at the end! We make excursions into the Pamirs and the Tien Shan. 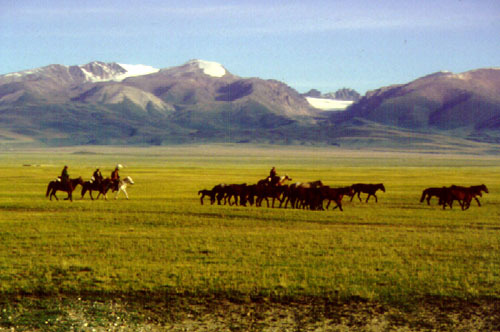 Amongst those same heavenly peaks we traverse the vast grasslands of Bayinbulak and Kyrgzystan. From the harsh light and dusts of the desert, these mountain glaciers, clear skies and greenery provide a welcome contrast. Monuments to two great faiths, Buddhism and Islam, season this tour. My personal favourite is Maji Shan. 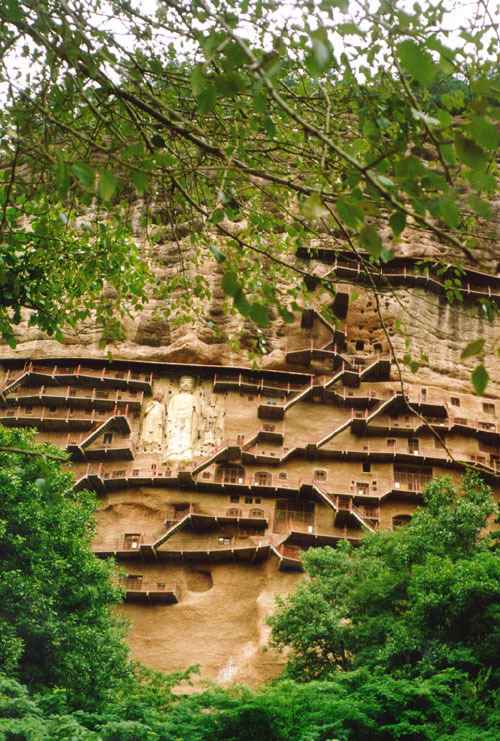 In caves cut into high cliffs of 'haystack mountain' are scores of angular, inclined, and sublime, statues of the Wei dynasty of sixteen hundred years ago. At Bingling Si the canvas is much more grand. Isolated in a remote side valley of the Yellow river the caves are nestled into red sandstone cliffs of organ-pipe grandeur. A massive Maitreya (the Buddha who is next to come) looks out across a narrow canyon. 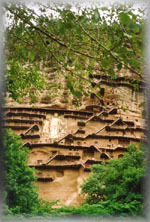 The caves of Mao gao near Dunhuang stand at the eastern end of the Taklamakan. 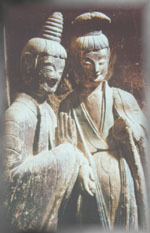 It is the diamond-point of Chinese Buddhist art. Stretched along two kilometres of cliffside are hundreds of caves, cut and painted by travellers thankful to have survived the desert or more apprehensively, by those about to enter. Continually extended for over a thousand years, their long history; their state of preservation; and the thousands of contemporary documents discovered within make this a site of international historical and artistic importance. It is quite, quite magnificent. Representational art is anathema to conventional Islam so further west there are no statues or paintings to delight the eye. 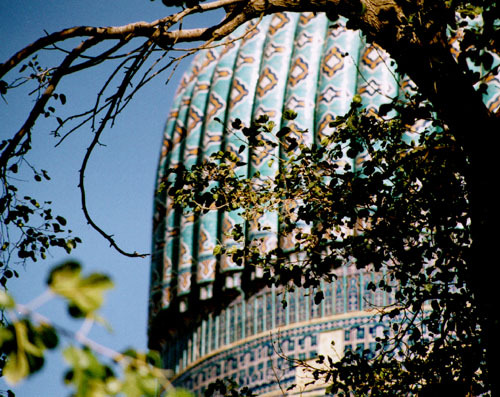 Instead, creative energy was directed to the construction of imposing buildings with a covering of turquoise tiles. 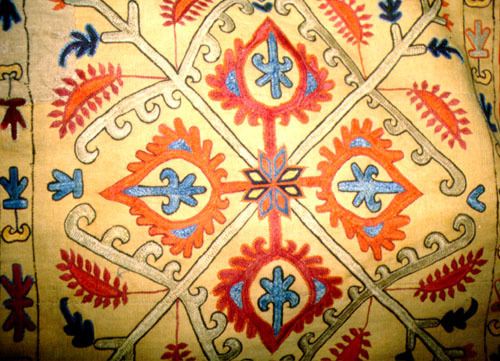 At Khiva, quite a different style of colour and design prevails. 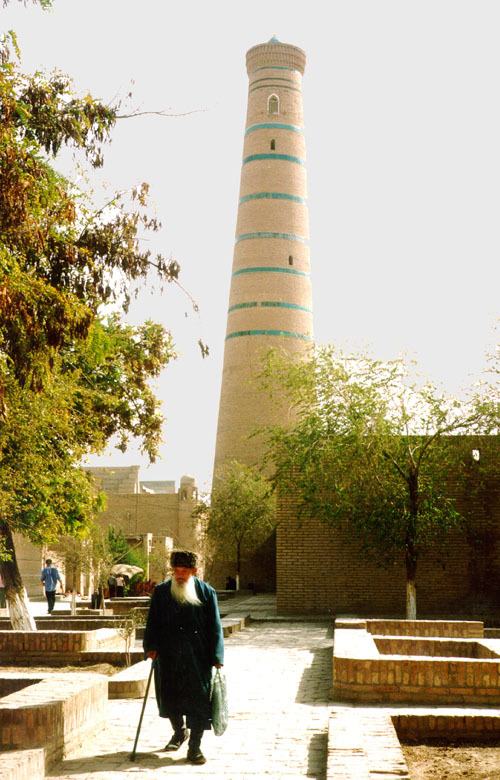 A translucent blue-green tiling merges easily into clear blue sky in the Islam Khodja minaret. Note: this option starts in Shanghai and ends in Bangkok. A final price for Threads 2013 will be decided early 2013 and will be sent to those interested. Please note: These prices when published are final but I reserve the right to make changes should major movements occur in currency or airfares. A final price for Threads 2013 will be decided early in 2013 and will be sent to those interested. It is very dependent on the NZ$ exchange rate to the US$. extra charge applies from other New Zealand cities. Please note: Prices, when published, are final but I reserve the right to make changes should major movements occur in currency or airfares. An informative, highly personalised introduction to some new places and interesting people with me! Return economy airfare from Christchurch, Wellington or Auckland to Bangkok and Shanghai � Twin-share accommodation in all cities � Breakfasts everyday � All Lunches and many dinners � A celebratory group dinner in ...I'm not sure, but somewhere nice!� Airport transfers and departure taxes throughout � all admission fees to museums and monuments. Visa fees for the countries visited [you will be sent information about this]. NZ departure tax � dinner, unless specified [most are provided]� personal insurance and medical expenses � excess baggage charges and items of a personal nature. his is a unique exploration of one famed silk route from China to Central Asia. It has been researched on the ground from start to finish, with the tour constructed to take the best advantage of the regions history and attractions. 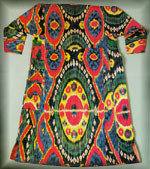 There is a particular emphasis on textiles, on crafts and the history of the region. It is delibrately not rushed. Is this a good trip?